Second Life Fetish Fashion Guide: Shoetopia Has Begun! The Shoetopia fair which we mentioned Tuesday is now on, until November 30th. The double sim layout is absolutely gorgeous - shoe heaven, city-of-angels kind of a theme. We know very few of the designers at this fair outside of Bax, and perhaps this will lead to posts about cool new stores - but there’s a good bit of non fetish footwear, so then again, maybe not. Bax’s booth is introducing her new patent leather boot, and is surprisingly fetishy; corsets and boots and things - I won’t spoil it for you, drop by and see it for yourself. 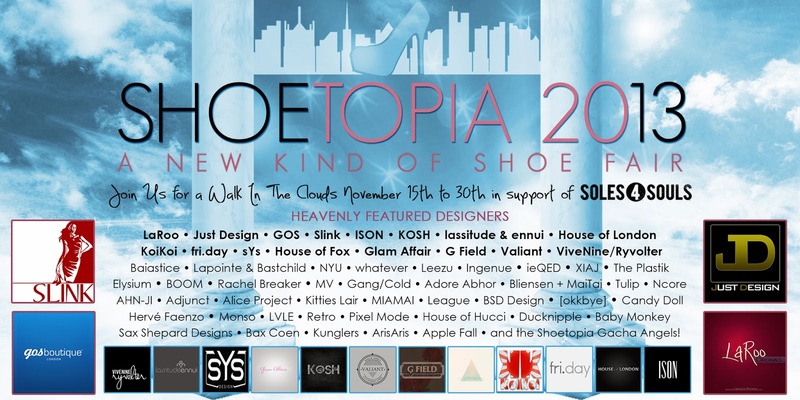 I remind you that the charity of the event is Soles4Souls, so give generously if you can.